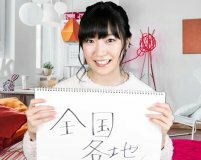 This was the 15th video by Maeshima Ami for her youtube channel. This video was around 5 minutes. Ami talked about 2018. She used a sketchbook, and wrote the main topics of 2018 about her private life and work. For her private life, Ami said she stared to live by herself. For her work, Ami said she went all over Japan for her stage play. She also went to Shanghai and Taiwan.